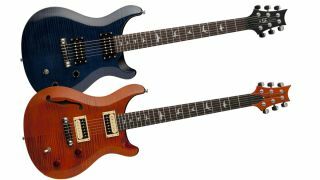 After creating a flurry of new models for its American-made S2 series, PRS hasn't forgotten about its cut-price SE line, either, adding the SE Custom 22 and SE Custom 22 Semi-Hollow to the Korean-made range. The SE Custom 22 features a maple-topped mahogany body in Vintage Sunburst or Whale Blue finishes, while the SE Custom 22 Semi-Hollow offers a maple top with single f-hole and flame maple veneer on a chambered mahogany body, and comes in Gray Black or Orange finishes. Both guitars feature a 25" scale length, PRS stoptail bridges, tuners, and Standard Treble and Bass humbuckers. The SE Custom 22 and SE Custom 22 Semi-Hollow are available from early September for £749 and £795 respectively. Check out PRS Guitars for more.